THE HEROESONLINE BLOG | HEROESCON 2012 :: NOW AVAILABLE :: STAN LEE AUTOGRAPH TICKET AND FAST PASS FROM DESERT WIND COMICS!! HEROESCON 2012 :: NOW AVAILABLE :: STAN LEE AUTOGRAPH TICKET AND FAST PASS FROM DESERT WIND COMICS!! Desert Wind Comics, Exclusive Facilitator of Stan Lee Autographs Presents Autograph Tickets and Fast Pass Opportunities! 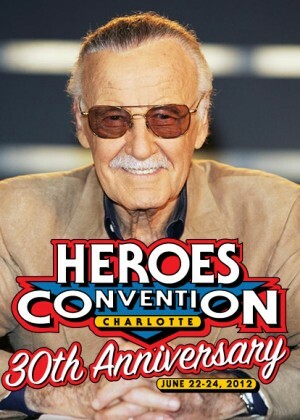 Although our VIP packages have sold out, everyone who attends HeroesCon 2012 will have an opportunity to meet Stan Lee! A LIMITED NUMBER of tickets will be offered exclusively through Desert Wind Comics are available now! The price for this special opportunity is $55.00 USD per autograph (which includes processing and handling fees). You must supply the item to be signed. Also offered by Desert Wind is the Stan Lee Fast Pass. The Fast Pass allows you to get into a special express line during a DWC Stan Lee signing. The express line is the first line to be signed after the VIP line. Please click the image of Stan or right here for full details. Depending on availability, on-site tickets may also be sold at the Desert Wind Comics booth beginning Friday, June 22nd. There is no guarantee that on-site tickets will even be available. Check with the Desert Wind Comics booth for details. Neither of these tickets grants admission to HeroesCon. PLEASE READ the ticket desciptions at the link and if you still have questions contact DWC at stanleetickets@desertwindcomics.com . Get your 3-day passes for $30 here! I have a question about the fast pass/autograph passes. Does either of these allow for a picture with Stan? My wife and I and our four kiddos (ages 6-12) are coming dressed as the Avengers and would value a group picture with him more than the autograph. How might this work? ← HEROESCON FUN RUN! DETAILS AND SHIRT PRE-ORDER INFO!